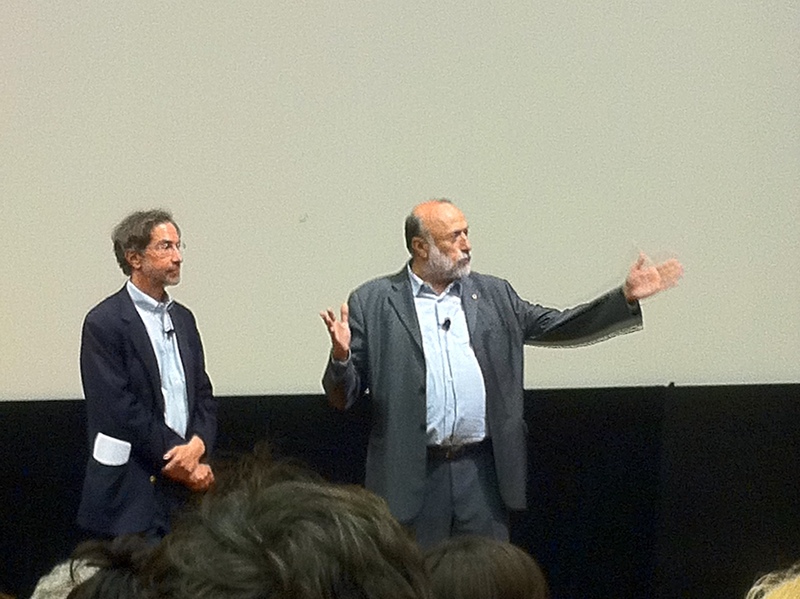 Carlo Petrini, founder and president of the international Slow Food movement, kicked off the much-anticipated Edible Education 101 lecture series at UC Berkeley this Tuesday. Given all the hype around the series (the ~300 free public tickets for this lecture were snatched up in <15 minutes), I wasn’t sure if I’d really get much as I might want from the talk. However Carlo far exceeded my expectations. He was an energetic and passionate speaker and, via his outstanding interpreter Corby Kummer, managed to crack quite a few cheesy yet successful jokes in the way only Italians can. Carlo’s main message was that there is a dire need for all of us to change the global paradigm surrounding food. For far too long, we’ve focused on productivity and efficiency. Carlo quoted Mark Twain, “to a man with a hammer, every problem is a nail.” The developed world’s hammer has been economics and business discipline, and we’ve approached food system challenges by incessantly increasing productivity and scale. But, as we all know, this paradigm has made a mess of the world. The global population is skewing rapidly towards the extremes of obesity on one end and malnourishment on the other. It takes more energy to produce food than the energy that food provides. In the rich world we spend more money to lose weight than we do to eat. And the global climate system is at risk. For the first time in history we are facing simultaneous energy, economic, and environmental crises. According to economist Kenneth Boulding, “anyone who believes exponential growth can go on forever in a finite world is either a madman or an economist.” The paradigm of forever increasing productivity of a finite food system is flawed and dangerous. We need to value more than just economy and business when we make decisions about food. Instead, we should bring the values of society, friendship and happiness into our decision-making process. We need to invest in our own happiness. We need to give value, respect, and dignity back to manual labor. Right now we don’t truly value our food. Food has a price, but doesn’t have value. And we can’t value food until we value those who produce it. Farmers should be respected just as much as university professors. To reinforce this point, Carlo invited all the undergraduates to take a minute and really think if they’d consider going into farming after graduation. He asked those that would to raise their hands and then brought the 20 or so of them to the front of the auditorium for us all to applaud them. We need to increase opportunities for reciprocity and conviviality. Carlo talked about three models for exchange in society: 1) linear exchange, 2) charity (according to him, “demonstrating superiority”) and 3) reciprocity, the answer for the future. He cited the CSA model as a great American-born example of a reciprocal system. It’s not a linear exchange. Instead community members give money to a farm in anticipation of getting something in return in the future. It’s a pay-it-forward model. And he wants to see more of that around the world. PS: I’ll be missing the next two lectures (Peter Sellars: Food as Culture and Marion Nestle: The Politics of Food) for my honeymoon. If you’re attending and would like to recap the lectures on this blog, please let me know by commenting on this post. Thanks! This entry was posted in Uncategorized and tagged Edible Education, Event, Event recap, Slow Food. Bookmark the permalink. Nice summary. Sorry to say I didn’t get a chance to compete for a ticket. Would have loved to hear it and “reciprocate” with other advocates of all things slow, sticky and sweet! (My bad .. as you can see, I’m into cheeses and honeys!) I particularly like the sense of the world of healthy food and thriving working together. To me, for the most part people advocate much for one favored area or another, often downplaying that the greatness of the sustainability movement is in the bringing together of all things natural into a different menu of opportunities. Good, respectful items we cherish should be favored because they also go so well with other ingredients of various types that themselves respect what the planet has to offer. That’s what my approach is in trying to build a virtual resource for us to collectively learn more about the world’s treasures of honeys and cheeses (there are way more types and flavors than most people realize), and then to be able to enjoy the economic, health and world vitality advantages of consuming them together as sweet and savory riches. I’ve just gotten started by putting together the first book on Green Gold: Pairing the World of Honeys & Cheeses and would love to hear more about what others have to say on the topic. Thanks for the great updates – and I just discovered your site a couple days ago!